PRINCETON, NJ -- Twenty-seven percent of Americans say it is now a good time to find a "quality job." This is up from the low levels between 2009 and 2012, but is not nearly as positive as during the pre-recession years from 2004 to 2007. The last time Americans' optimism about job prospects reached 30% was January 2008. 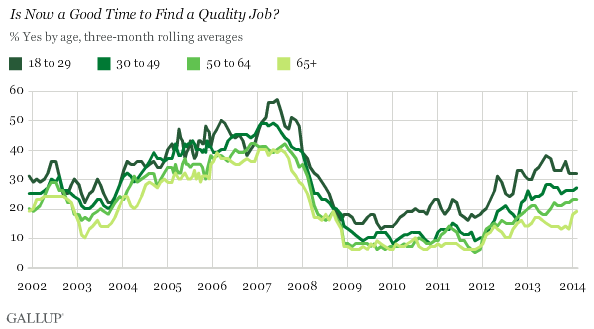 Since Gallup began asking the quality jobs question monthly in October 2001, the proportion of Americans saying it is a good time to find a quality job has ranged from a high of 48% in January 2007 to a low of 8% in November 2009 and November 2011. By way of comparison, Americans actively in the workforce were asked this question in surveys conducted by the University of Connecticut from 1998 to 2000. In August 2000, at the end of the dot-com boom, 78% of those employed or unemployed but looking for work said it was a good time to find a quality job. Thus, while the current results on this measure are more positive than the recent lows, they are far more negative than at times in the past, and continue to reflect Americans' generally pessimistic views of the U.S. job market. The nearly 13-year trend on this question clearly reflects changes in the country's underlying economic reality, but the responses also reflect Americans' political views. When George W. Bush was president, Republicans were substantially more positive than Democrats were about the job market. Since 2009, with Barack Obama in the White House, Democrats have been more positive. The difference between Republicans, including Republican-leaning independents, and Democrats and Democratic-leaning independents, was particularly pronounced in the latter years of George W. Bush's presidency. From 2004 to 2007, Republicans were often more than 30 percentage points more likely than Democrats were to say job prospects were good. Partisan differences shrank considerably during the recession, and stayed small during the first three years of Obama's first term. 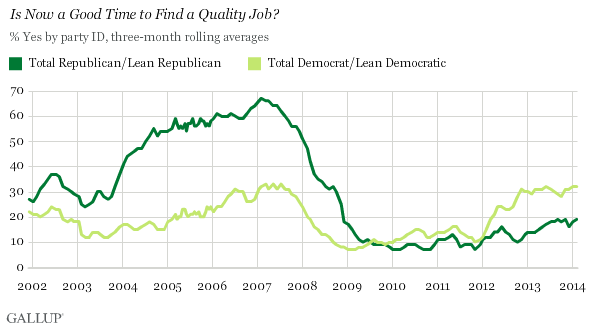 Democrats' positive views about the job market edged higher than Republicans' beginning in August 2009, but never by more than 10 points until 2012. Beginning in spring 2012, the gap between Democrats and Republicans grew, reaching its widest point in November 2012, just after the presidential election. At no point during the Obama administration so far, however, has the Democratic advantage on this measure been nearly as large as the Republican advantage during the latter part of the Bush years. Thus, the currently depressed views of the job market reflect relatively dour perceptions among those who identify with both parties. The view among Democrats that it is a good time to find a quality job has yet to surge under the current Democratic president to match the level of optimism Republicans had about jobs under the last Republican president. Meanwhile, Republicans' optimism during the Bush years collapsed as Obama took office, and shows only modest signs of recovering. Younger Americans between the ages of 18 and 29 have been at least as positive as any other age group about the job market, but that pattern has become most pronounced since Obama took office. Those aged 65 and older have generally been the most pessimistic, although not always more so than other age groups. Younger Americans typically give Obama higher job approval ratings than any other age group, so the recent larger age gap may reflect the influence of partisanship and the "audacity of hope." Still, given that younger Americans also tended to be as positive as other groups during the Bush years, politics alone may not explain their outlook; a general youthful positivity about jobs may also play a part. A robust job market is one of the most important components of a bustling economy, a fact attested to by the close attention paid to the barrage of jobs data that regularly pours forth from the government and other sources. In contrast to these more complex economic measures, the data reviewed here are quite straightforward, relying on Americans' simple self-reports on their views of the jobs situation. This quality job measure is valuable because the majority of Americans are in the workforce and thus on the firing line when it comes to jobs, and therefore have unique "insider" perspectives on the U.S. jobs situation. The fact that 70% of Americans continue to say it is not a good time to find a quality job is an important indicator of the still-shaky nature of the U.S. economy. There is some modestly good news. 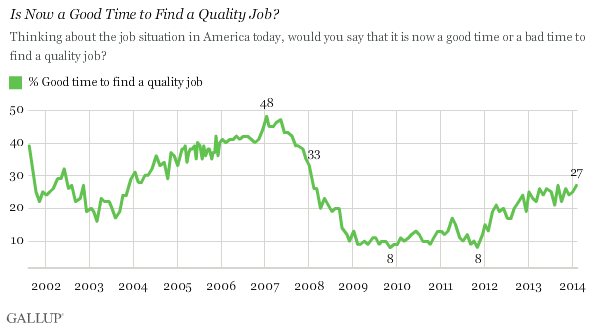 More Americans now say it is a good time to find a quality job than said this during the depths of the recession, when at several points 90% said it was not a good time to find a quality job. On the other hand, current levels are well below where they were from 2005 to 2007, and even lower than they most likely were during the dot-com boom. All in all, regardless of the precise nature of what is happening in the economy, if Americans define a situation as real, the consequences can be real. This means the current perception that it's not a good time to be looking for a job can translate into restraints on consumer spending, major economic commitments, moving, and other actions that could stimulate the economy. Results for the February Gallup poll are based on telephone interviews conducted Feb. 6-9, 2014, with a random sample of 1,023 adults, aged 18 and older, living in all 50 U.S. states and the District of Columbia. Results based on previous months' surveys for the most part also have margins of sampling error of ±4 percentage points.